petition: Give Disgraced Senator Anning's Seat to Egg Boy, the Teen Who Fought Hate With an Egg! Give Disgraced Senator Anning's Seat to Egg Boy, the Teen Who Fought Hate With an Egg! After the horrific massacre of Muslim worshipers in two mosques in New Zealand, most of the world recoiled in horror. In the blink of an eye, the killer, Australian native, Brenton Tarrant killed more people in New Zealand than were killed in that country the entire year of 2017. In the end, 50 people lost their lives. As news of the shooting made its way around the world, world leaders took to the airwaves to denounce the Tarrant, his white supremacist views and Islamophobia. Unfortunately, not all leaders saw what happened in Christchurch as a bad thing. "As always, leftwing politicians and the media will rush to claim that the causes of today's shootings lie with gun laws or those who hold nationalist views, but this is all cliched nonsense. The Twitterverse exploded with many calling for Anning to resign. Others decided to express their displeasure with the senator's repulsive views in a far more hands-on approach. 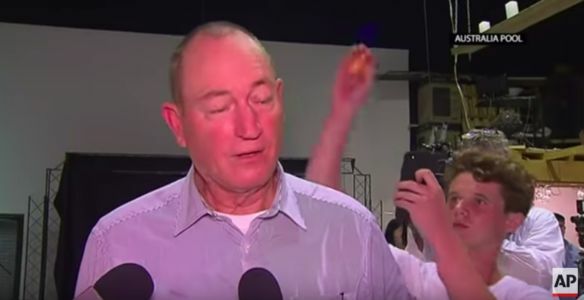 While Senator Anning was giving an interview, 17-year-old Will Connolly walked up to him and gave him the ole "poultry pat." With an egg in one hand and a camera in the other, Connolly, smashed an egg on the senator's head. It was the crack heard around the world, a heroic move, an ef you to bigots and haters alike. Anning, being the coward that he is, turned around and, on national TV, cold-cocked the teen. His acolytes tacked Connolly and held him in a chokehold until he was taken away. After video of the attack went viral, the whole world hailed Connolly, AKA, Egg Boy as a hero. Even the prime minister Scott Morrison sided with the teen saying that Anning should face the "full force of the law." The senators's vile comments, provoked Australians and people around the world to demand that the white supremacist senator resign. We hope that happens, but that leaves a vacancy in the Senate. Who better to fill that seat than Anning's arch enemy, Egg Boy himself. Voice your support for a politician who knows how to crack the system. Sign the petition and tell Egg Boy you want him to run for Senate.